• Remove obsolete Rancho Cordova region. • Add replacement East Sacramento region. • Add/fix support for iPhone 5. • Raises minimum supported iOS version to 4.3. Please note that version 3.5.x is likely going to be the last version that supports iOS 4.x. If you are still using CHP Traffic on a device with iOS prior to 5.0 and have no plans to upgrade, please let us know! Version 3.5 adds support for the new CHP CAD dispatch system. In particular, incidents in several converted dispatch centers (Los Angeles, Orange County, and San Diego) were being displayed in their parent dispatch center instead of the specific region. For example, South LA incidents were showing up in Southern Division. As always, please contact us if you have any questions about the app. We are here for you! And special thanks go to those of you who worked with us while we resolved this issue; we appreciate your support! 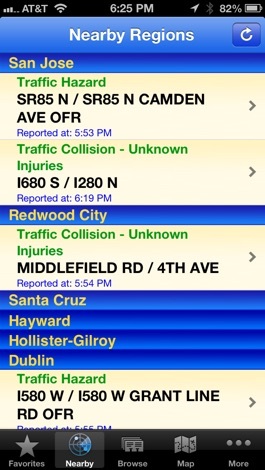 CHP Traffic gives you quick, real-time access to the traffic incident data provided by the California Highway Patrol. CHP Traffic uses public information provided by the computer aided dispatch office, so it's always up-to-date. Tired of waiting for talk radio "traffic on the fives?" Want to make sense of what you just heard on the radio by seeing it on a map? GPS traffic info not detailed enough for you? Get instant, accurate, and official CHP traffic info for ALL of California in a portable and easy-to-read format. Want to check for accidents before you head out so you can choose the better route to take? Live in an area not covered by traffic data in Maps or your GPS so you need to estimate it yourself? Curious as to why your trip to work took an extra 20 minutes today? Need to check whether a Sigalert is still active? This application lets you do it! * Use your current location to find traffic incidents near you. * Traffic incidents that are likely to cause significant delay are automatically highlighted in red; highlighting is customizable. * Exchange links to incidents or full incident logs with friends. * Incident location display uses a large, bold font for easy reading at a glance. * Search for incidents using simple phrases or complex route filters; searches update live as incidents are created and retired by the CHP. 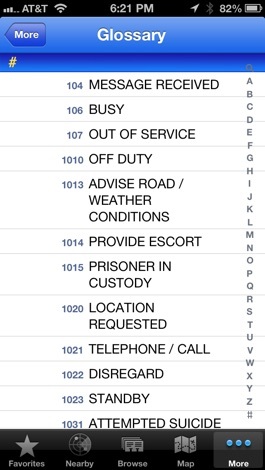 * Detailed incident logs are a tap away. Please note that CHP Traffic groups traffic incidents by the CHP DISPATCH center and/or regional office that is responsible for them. For example, incidents in Goleta or Montecito would be listed under Santa Barbara (the name of the regional office) or Ventura (the controlling dispatch center), depending on where in the app you were looking. Rest assured that, taken together, the CHP district and regional offices listed in CHP Traffic cover ALL of California's highways. For more information, please see the FAQ section of our website at: http://apps.santosland.com/home/faq. We want to hear from you! Having a problem? Can't figure out how to use CHP Traffic? Please give us a chance to address your concerns! Have a compliment or suggestion for improvement? Please let us know! Visit our Facebook page (facebook.com/chptraffic), send us an e-mail or visit our website. CHP Traffic uses only public information published by the California Highway Patrol. Please note that the CHP does not publish information about certain types of police actions (most notably, police pursuits), and therefore CHP Traffic cannot provide information on these incidents. 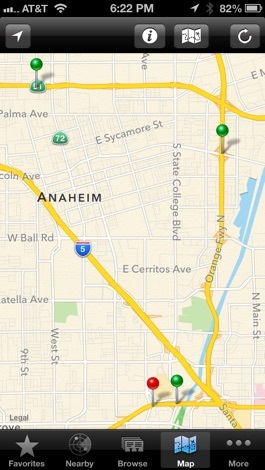 SantosApps and the CHP Traffic application are not associated with the California Highway Patrol in any way. Always use common sense: never use this or any other application while driving. And now Verbi goes PRO. 1000+ verbs. Are you learning Italian? Just improving it? Give me a try! Italian verbs will become your second nature. Enjoy ! Download this FREE app for advance notification of sales, events, videos!